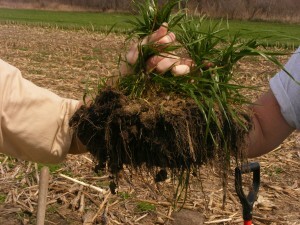 Annual Ryegrass has very deep, fibrous roots. 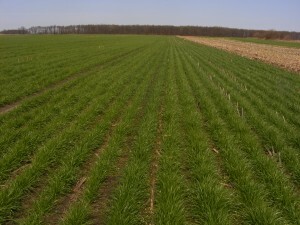 Annual Ryegrass is one of the more popular and also one of the more vilified of the cover crops. 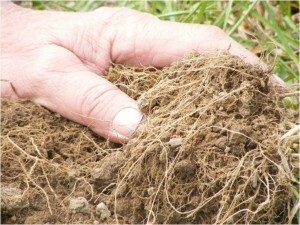 Those that love it cite the deep fibrous roots and excellent soil tilth improvement. Those that loathe it cite that it does not always survive the winter…or that they can’t kill it if it does! Thankfully there are a few very good winterhardy varieties on the market and the method of killing annual ryegrass is becoming more refined and dependable. Annual Ryegrass has many benefits and a few disadvantages. I list them below. It is a deep rooted cover crop that helps mine minerals from deep in the soil profile. It is an excellent erosion control crop. It is a luxury consumer of nitrogen and tremendous scavenger of N.
It works well aerial applied into corn and soybeans. It also makes an excellent forage crop. Corn following annual ryegrass often yields more and is more drought tolerant due to depth of roots and holding N in the soil from previous fertilizer applications. Excellent with manure applications…holds N in soil profile, out of tile drains. Many varieties are not winterhardy (many rarely make it through the winter alive). It may be difficult to kill in the spring. It takes more management than many other cover crops. Annual Ryegrass in the spring of 2010. Planted in 15" rows, this erosion fighting cover crop was a huge success. The root structure on Annual ryegrass is impressive. Even when planted in 15" rows the roots filled in between the rows. ← Cover Crop Radishes and Turnips…what are their differences?